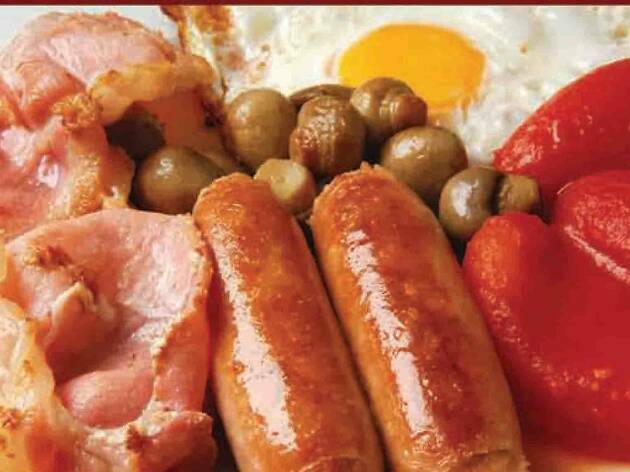 The fry-up is a hallowed meal for many. 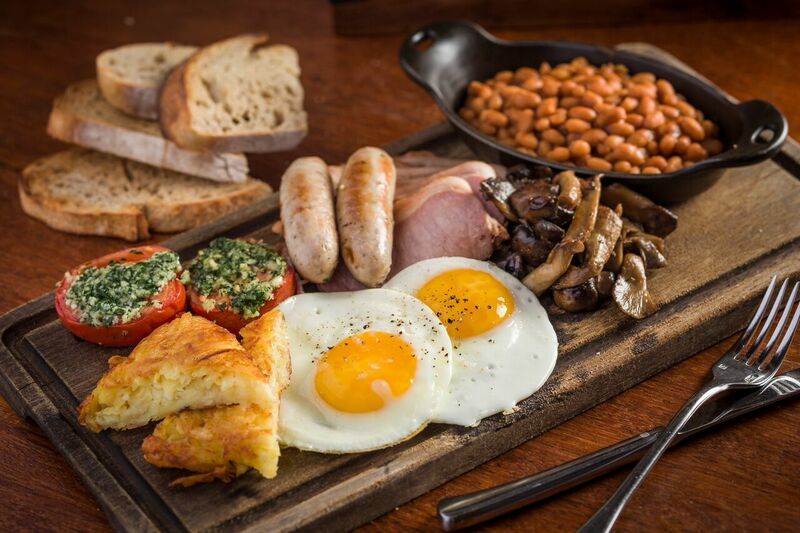 What better way to kick-start your day than a massive plate of (and various combinations of) sausages, eggs, bacon, toast, black pudding, baked beans, tomatoes, mushrooms and chips? It’s the perfect hangover cure too if anyone going to hard at one of Hong Kong’s best bars. RECOMMENDED: If it does all sound too much though, try Hong Kong’s best places for pancakes. Or to take it to the next level, an epic brunch with free-flow options? 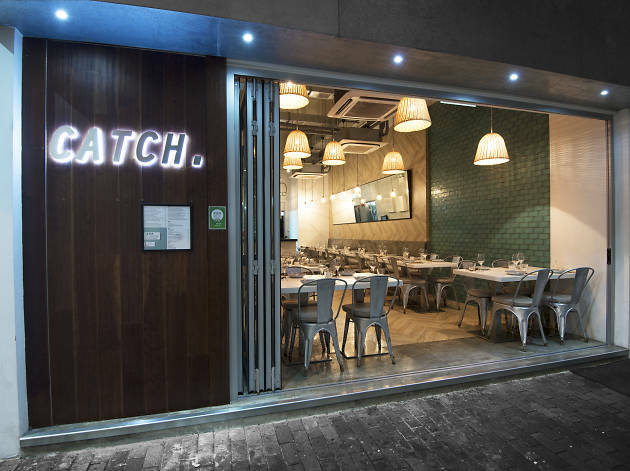 Now with branches in Wan Chai, Mong Kok, Sheung Wan and Tsim Sha Tsui, it’s hard to believe that 18 Grams first started out at as a tiny espresso bar in Causeway Bay. But we’re not here for the caffeine this time, friends. We’re here for severe grease injection. 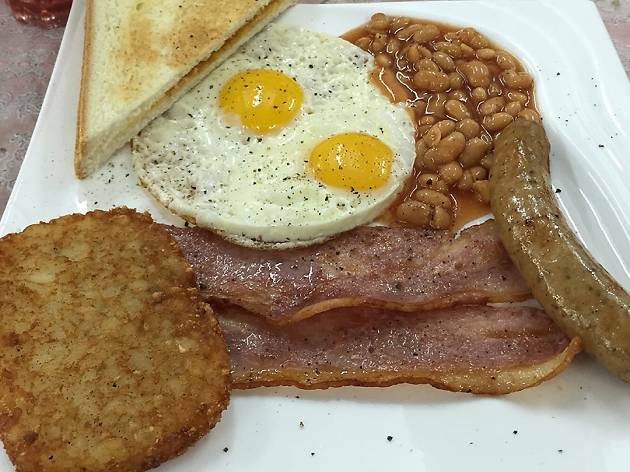 Don’t be put off by the fact that they try to give it a healthy edge by calling it an ‘Aussie breakfast’ ($108). 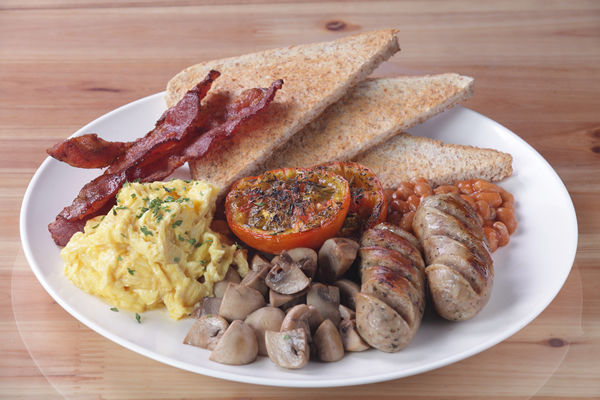 What they’re offerring is solid – sausages, mushrooms, scrambled eggs, bacon, baked beans and grilled tomatoes. All the usual suspects then, handled deftly. Ready to hike Plover Cove Country Park? 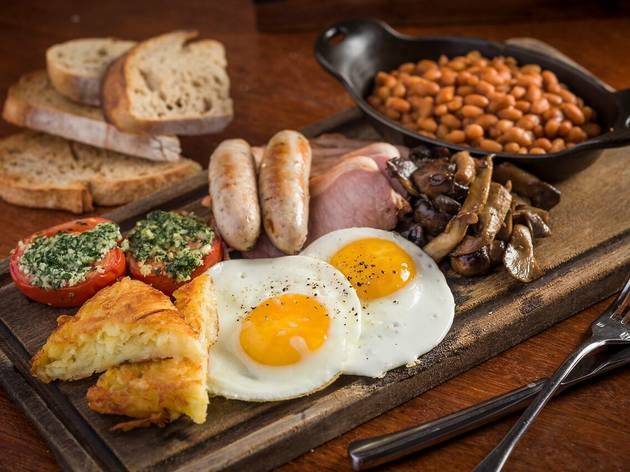 Bet you didn’t think you’d be able to smash a fried breakfast before doing so. Well, think again. 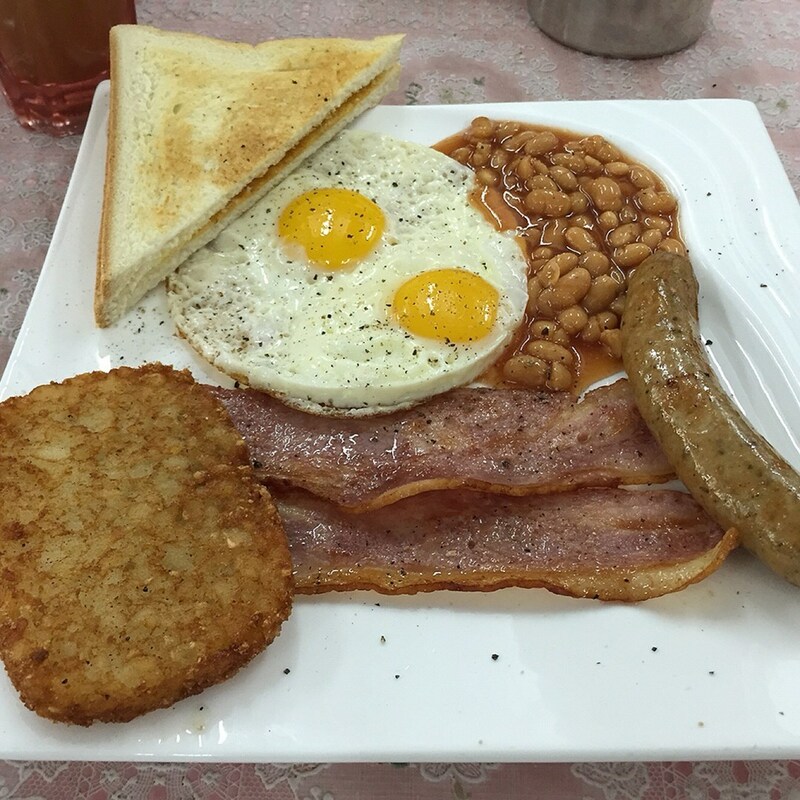 Chan Kun Kee is a hidden gem that’s probably the last place you’d expect to get a full English and it offers a stellar breakfast for relative pennies compared to flash peers in places like Sheung Wan. 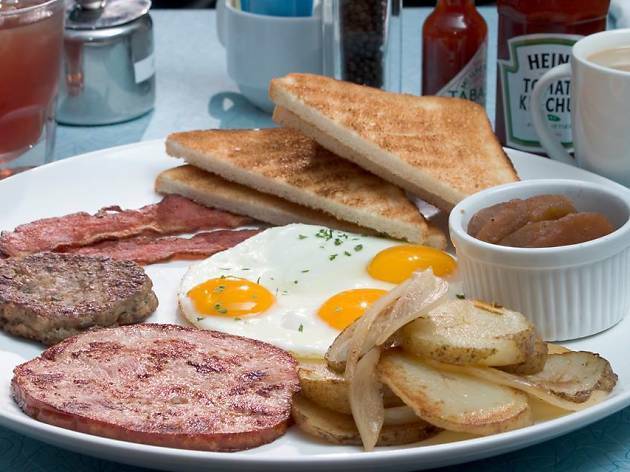 A mere $65 gets you the deluxe breakfast – two fried eggs, two rashers of bacon, a pork sausage, hash brown, baked beans and toast that comes with either coffee or tea. Amazing. 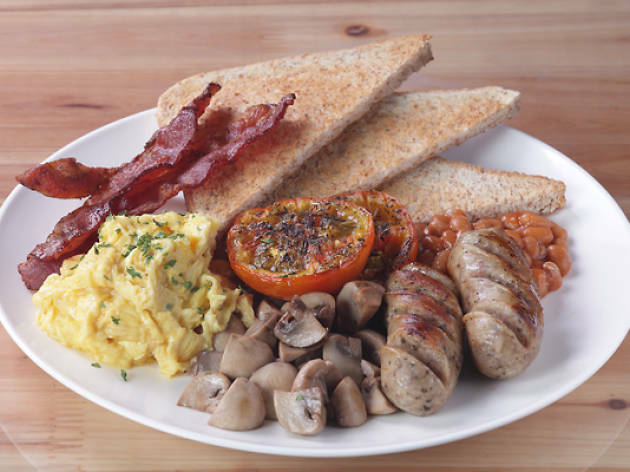 Being a Gordon Ramsay restaurant, you might expect London House’s full English to contain some pretentious accoutrements – bacon from celebrity pigs or unicorn sausages. 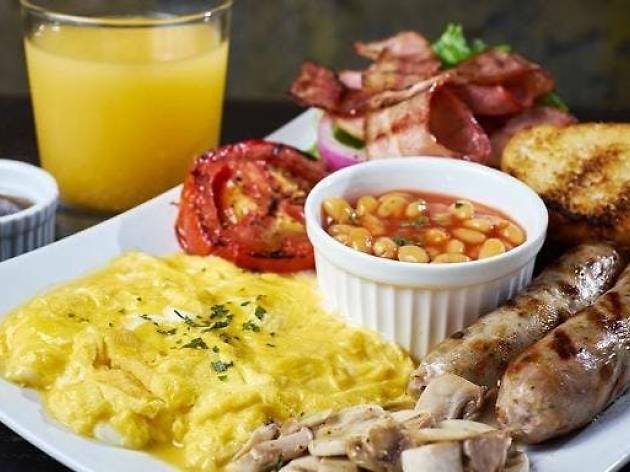 But, nay, for $178 on London House’s brunch menu ordering a full English (available daily from 11am to 3pm) will get you a straightforward plate of bacon, sausages, mushrooms, tomato and beans (in a ramekin – bonus points). 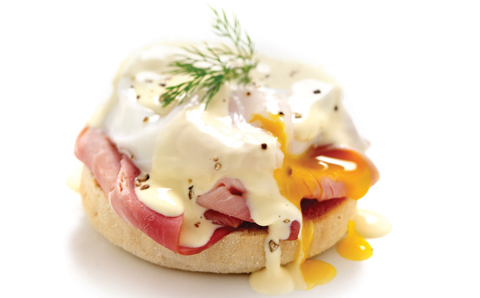 To cap it off, you get a side plate of toast with poached eggs and hollandaise sauce. That last bit might not be everyone’s cup of tea, but it’s a classy extra all the same. This Kennedy Town spot tries to channel the quintessential Melbournian hipster breakfast. 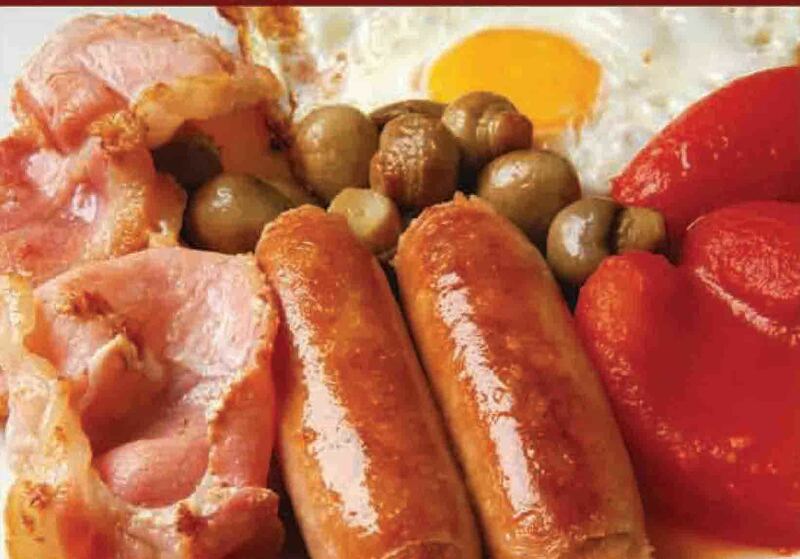 And we’re happy to report they pull it off with great success – though, don’t expect a traditional fry-up. Go for the Big Bad Ben ($158) to get yourself a fry-up with a twist – poached eggs, bacon, avocado, chorizo, hash brown, hollandaise and siracha. It’s weird, slightly sacrilegious and an affront to the traditional English breakfast, but delicious all the same. 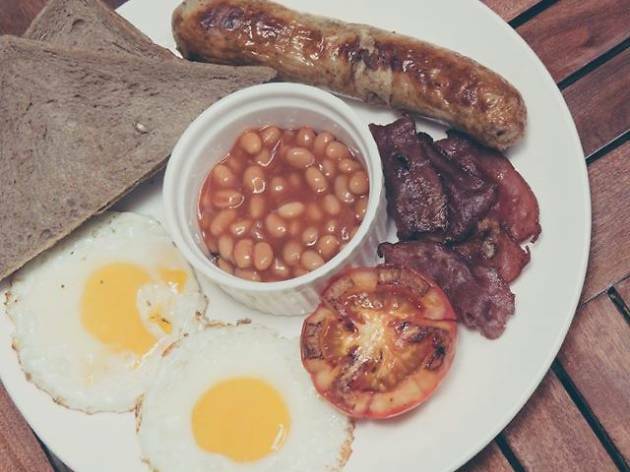 This cool Sai Ying Pun spot has a whole menu of cracking eats but its fry-up ($118) does justice to the name, setting itself apart with quality ingredients: sausage (the star of the show), bacon, eggs, tomato, beans and brown bread. Nothing game changing but the gaff does the simple things well, making it well worth your time. 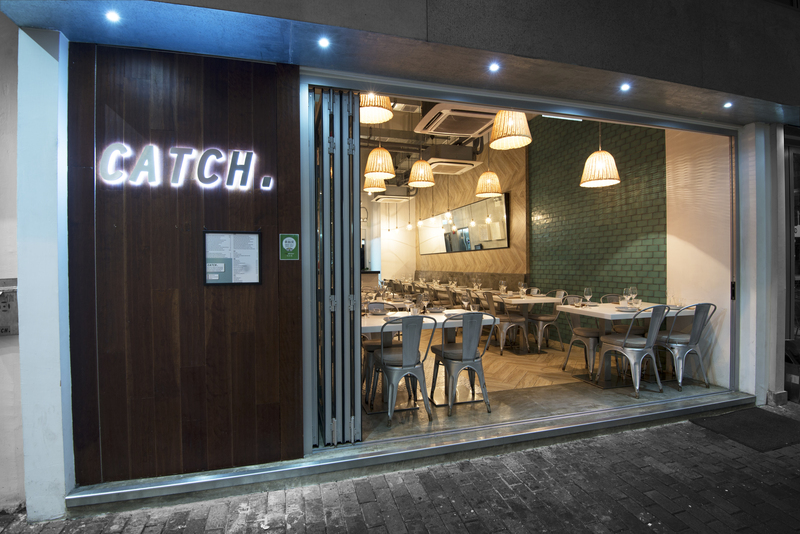 Located in North Point, The Big Bite is a Canadian-style burger restaurant. That might not strike you as prime fry-up territory, but don’t judge a book by it’s maple-laden cover. 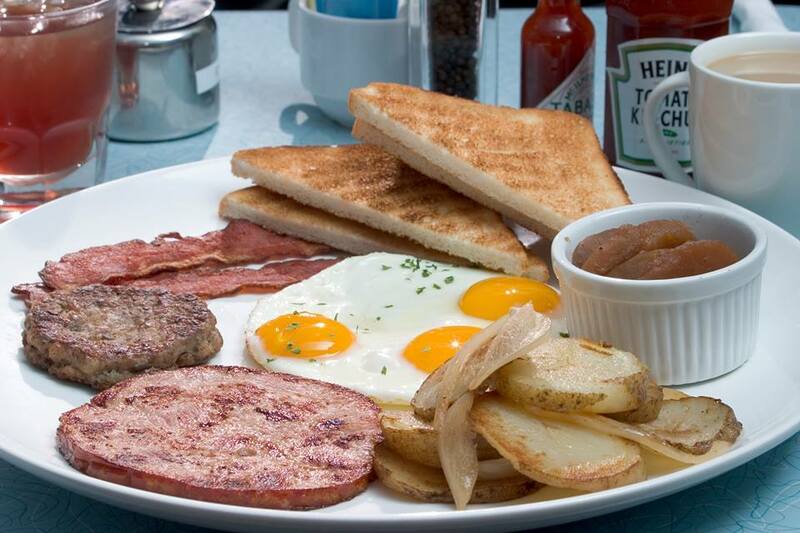 In an unsuspecting corner of the menu sits the All D'eh Breakfast ($95). Only available at weekends, this bad boy is packing eggs, bacon, sausages, baked beans, grilled tomato and, crucially, fried bread. Delaney’s Tsim Sha Tsui location is much the same as the chain’s other branch in Cyberport with a regular happy hour (3pm-9pm daily) and multiple TV screens for sport. Want to know what else they have? 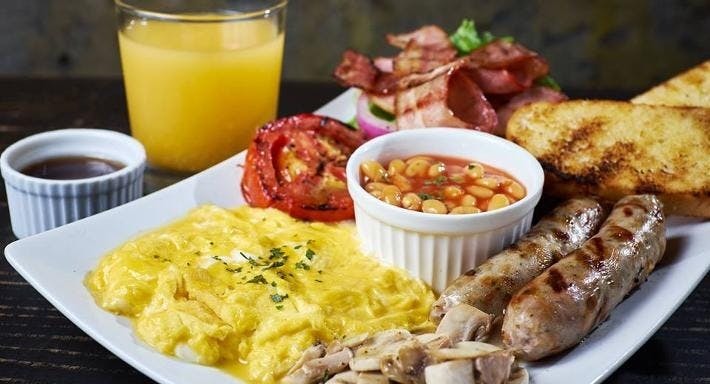 The coming together of eggs, bacon, sausage, black pudding, tomatoes, hash browns and coffee/tea or orange juice in what they call the Grand Irish Breakfast ($144). We know, we know – no beans. It might make for a slightly dry breakie, but we must learn to respect others’ differences. It may not represent the absolute pinnacle of fried food but the Flying Pan offers a vast menu of solid Americanised offerings. There’re two things that set this place apart, though. Firstly, they’re open all night. Secondly, they offer you the chance to eat quantities of food not offered to you by most other venues – we’re talking food challenge quantities. Well done, Pan. Want something a big lighter? 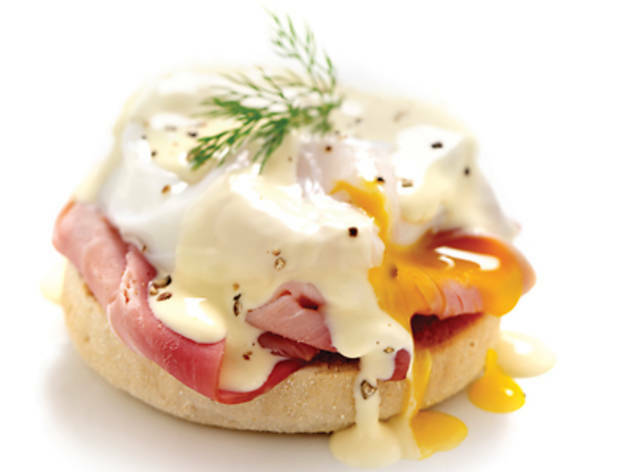 Eggs benedict are one of the best brunch choices for early risers the world over. So, if you're past pancakes, waning with waffles or 'ad enough of avos, grab a cup of coffee and hunker down with some of the best benes in town.